张真, 胡忠军, 史先鹤, 任丽萍, 盘家永, 崔亮, 陈来生, 何光喜, 刘其根. 千岛湖浮游植物群落结构及功能群的划分[J]. 上海海洋大学学报, 2019, 28(1): 37-48. ZHANG Zhen, HU Zhongjun, SHI Xianhe, REN Liping, PAN Jiayong, CUI Liang, CHEN Laisheng, HE Guangxi, LIU Qigen. Community structures and functional groups of phytoplankton in Qiandao Lake[J]. Journal of Shanghai Ocean University, 2019, 28(1): 37-48. 李大命, 于洋, 张彤晴, 等. 太湖春季和秋季浮游植物的光合作用活性[J]. 环境科学研究, 2014, 27(8): 848-856. LI D M, YU Y, ZHANG T Q, et al. 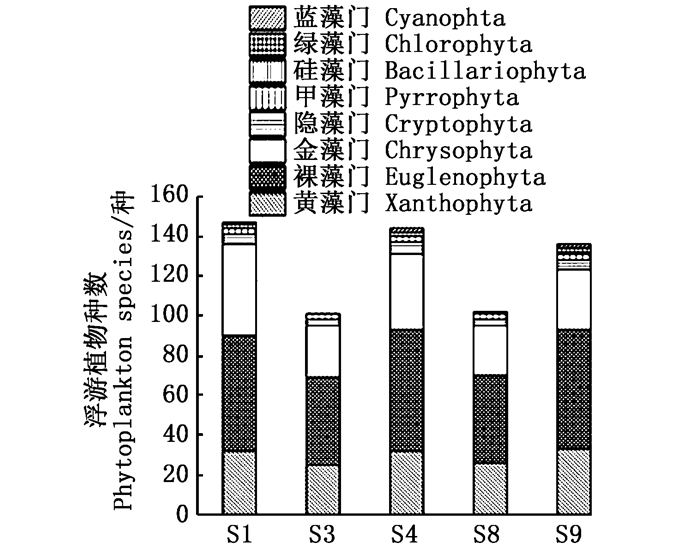 Photochemical activity of phytoplankton in Taihu Lake in spring and autumn[J]. Research of Environmental Sciences, 2014, 27(8): 848-856. 李秋华, 何伟添, 陈椽. 澳门湿地浮游植物群落特征[J]. 植物生态学报, 2009, 33(4): 689-697. KALFF J.湖沼学: 内陆水生态系统[M].古滨河, 刘正文, 李宽意, 等, 译.北京: 高等教育出版社, 2011. KALFF J. Limnology: inland water ecosystems[M]. GU B H, LIU Z W, LI K Y, et al, trans. Beijing: Higher Education Press, 2011. 程曦, 李小平. 淀山湖氮磷营养物20年变化及其藻类增长响应[J]. 湖泊科学, 2008, 20(4): 409-419. 刘建康. 高级水生生物学[M]. 北京: 科学出版社, 1999. LIU J K. Higher aquatic biology[M]. Beijing: Science Press, 1999. 韩希福, 王荣. 海洋浮游动物对浮游植物水华的摄食与调控作用[J]. 海洋科学, 2001, 25(10): 31-33. 陈济丁, 任久长, 蔡晓明. 利用大型浮游动物控制浮游植物过量生长的研究[J]. 北京大学学报(自然科学版), 1995, 31(3): 373-382. REYNOLDS C S. Ecology of phytoplankton[M]. Cambridge: Cambridge University Press, 2006: 38-90. 张雅燕, 吴志旭, 朱溆君. 千岛湖藻类及相关环境因子多元线性回归和鱼腥藻预测模型的建立[J]. 中国环境监测, 2002, 18(3): 37-41. 吴志旭, 刘明亮, 兰佳, 等. 新安江水库(千岛湖)湖泊区夏季热分层期间垂向理化及浮游植物特征[J]. 湖泊科学, 2012, 24(3): 460-465. 兰佳, 吴志旭, 李俊, 等. 新安江水库浮游植物群落特征及影响因素分析[J]. 中国环境监测, 2014, 30(2): 40-46. 胡忠军, 孙月娟, 刘其根, 等. 浙江千岛湖深水区大型底栖动物时空变化格局[J]. 湖泊科学, 2010, 22(2): 265-271. HU Z J, SUN Y J, LIU Q G, et al. Temporal and spatial distribution of profundal macrozoobenthic community in Lake Qiandao, Zhejiang, China[J]. Journal of Lake Sciences, 2010, 22(2): 265-271. 董静, 李艳晖, 李根保, 等. 东江水系浮游植物功能群季节动态特征及影响因子[J]. 水生生物学报, 2013, 37(5): 836-843. DONG J, LI Y H, LI G B, et al. Seasonal dynamics characteristics and affecting physical factors of phytoplankton functional groups in Dongjiang River[J]. Acta Hydrobiologica Sinica, 2013, 37(5): 836-843. 毕列爵, 胡征宇. 中国淡水藻志(第八卷)-绿藻门:绿球藻目(上)[M]. 北京: 科学出版社, 2004. BI L J, HU Z Y. Flora algarum sinicarum aquae dulcis[M]. Beijing: Science Press, 2004. 朱浩然. 中国淡水藻志(第二卷):色球藻纲[M]. 北京: 科学出版社, 1991. ZHU H R. Flora algarum sinicarum aquae dulcis[M]. Beijing: Science Press, 1991. TILMAN D, KILHAM S S. Phosphate and silicate growth and uptake kinetics of the diatoms Asterionella formosa and Cyclotella meneghiniana in batch and semicontinuous culture[J]. Journal of Phycology, 1976, 12(4): 375-383. 陆欣鑫, 刘妍, 范亚文. 呼兰河湿地夏秋两季浮游植物功能分组演替及其驱动因子[J]. 生态学报, 2014, 34(5): 1264-1273. 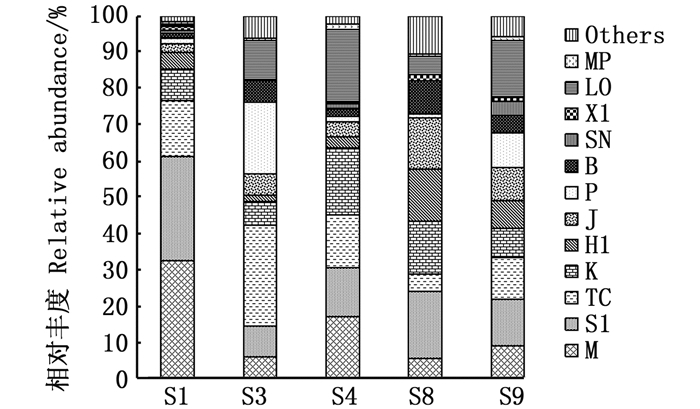 LU X X, LIU Y, FAN Y W. Relationships between environmental variables and seasonal succession in phytoplankton functional groups in the Hulan River Wetland[J]. Acta Ecologica Sinica, 2014, 34(5): 1264-1273. 严文逸, 王绍祥, 顾静, 等. 青草沙水库浮游藻类群落组成及其与环境因子的关系[J]. 上海海洋大学学报, 2017, 26(1): 75-84. YAN W Y, WANG S X, GU J, et al. Composition of planktonic algae community and its relationship with environmental factors in Qingcaosha Reservoir[J]. Journal of Shanghai Ocean University, 2017, 26(1): 75-84. 邓建明, 蔡永久, 陈宇炜, 等. 洪湖浮游植物群落结构及其与环境因子的关系[J]. 湖泊科学, 2010, 22(1): 70-78. DENG J M, CAI Y J, CHEN Y W, et al. Structure of phytoplankton community and its relationship with environment factors in Lake Honghu[J]. Journal of Lake Sciences, 2010, 22(1): 70-78. DOMINGUES R B, SOBRINO C, GALVÃO H. Impact of reservoir filling on phytoplankton succession and cyanobacteria blooms in a temperate estuary[J]. Estuarine, Coastal and Shelf Science, 2007, 74(1/2): 31-43. 胡忠军, 莫丹玫, 周小玉, 等. 千岛湖浮游植物群落结构时空分布及其与环境因子的关系[J]. 水生态学杂志, 2017, 38(5): 46-54. HU Z J, MO D M, ZHOU X Y, et al. Spatial and seasonal distribution of phytoplankton in Qiandao Lake and relationship with environmental factors[J]. Journal of Hydroecology, 2017, 38(5): 46-54. 董旭辉, 羊向东, 王荣. 长江中下游地区湖泊富营养化的硅藻指示性属种[J]. 中国环境科学, 2006, 26(5): 570-574. 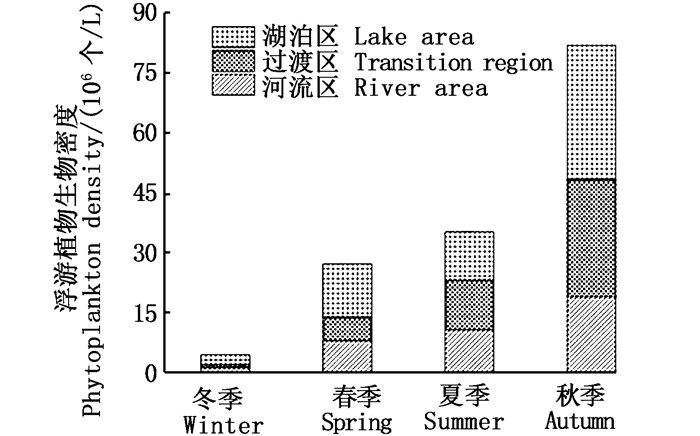 LIU Q G. Aquatic environmental protection oriented fishery in Lake Qiandaohu and its influences on lake ecosystem[D]. Shanghai: East China Normal University, 2005. 韩伟明, 胡水景, 金卫, 等. 千岛湖水环境质量调查与保护对策[J]. 湖泊科学, 1996, 8(4): 337-344. HAN W M, HU S J, JIN W, et al. Investigation and protection countermeasures of water environmental quality in Qiandao Lake[J]. Journal of Lake Sciences, 1996, 8(4): 337-344. 杨亮杰, 余鹏飞, 竺俊全, 等. 浙江横山水库浮游植物群落结构特征及其影响因子[J]. 中国应用生态学报, 2014, 25(2): 569-576. YANG L J, YU P F, ZHU J Q, et al. 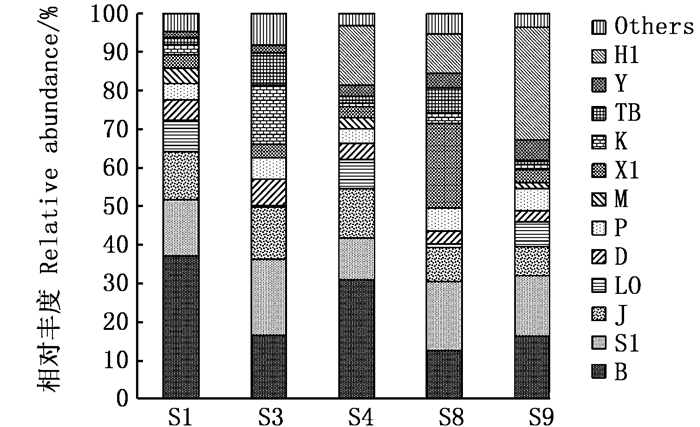 Community structure characteristics of phytoplankton and related affecting factors in Hengshan Reservoir, Zhejiang, China[J]. 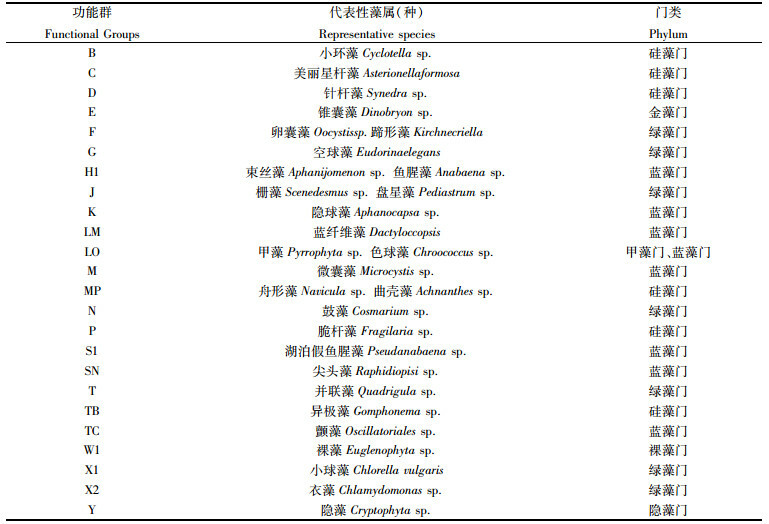 Chinese Journal of Applied Ecology, 2014, 25(2): 569-576. 盛海燕, 虞左明, 刘明亮, 等. 千岛湖冬季浮游植物光合活性[J]. 生态学杂志, 2014, 33(2): 365-372. SHENG H Y, YU Z M, LIU M L, et al. 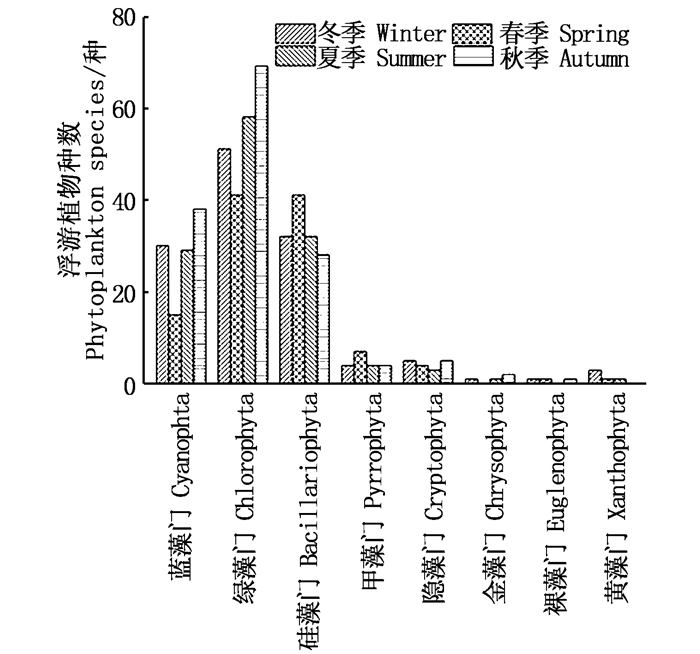 The photosynthetic activity of phytoplankton in Qiandao Lake in winter[J]. Chinese Journal of Ecology, 2014, 33(2): 365-372. 吕唤春, 王飞儿, 陈英旭, 等. 千岛湖水体叶绿素a与相关环境因子的多元分析[J]. 应用生态学报, 2003, 14(8): 1347-1350. 潘继征, 熊飞, 李文朝, 等. 抚仙湖浮游植物群落结构、分布及其影响因子[J]. 生态学报, 2009, 29(10): 5376-5385. PADISÁK J, BARBOSA F, KOSCHEL R, et al. Deep layer cyanoprokaryota maxima in temperate and tropical lakes[M]//KOSCHEL R, ADAMS D. Lake Stechlin. An Approach to Understanding an Oligotrophic Lowland Lake. Archiv für Hydrobiologoe/Advances in Limology, 2003, 58: 175-199. 张怡, 胡韧, 肖利娟, 等. 南亚热带两座不同水文动态的水库浮游植物的功能类群演替比较[J]. 生态环境学报, 2012, 21(1): 107-117. 黄享辉, 胡韧, 雷腊梅, 等. 南亚热带典型中小型水库浮游植物功能类群季节演替特征[J]. 生态环境学报, 2013, 22(2): 311-318. 黄国佳, 李秋华, 陈椽, 等. 贵州高原三板溪水库浮游植物功能群时空分布特征[J]. 环境科学学报, 2015, 35(2): 418-428. HUANG G J, LI Q H, CHEN C, et al. 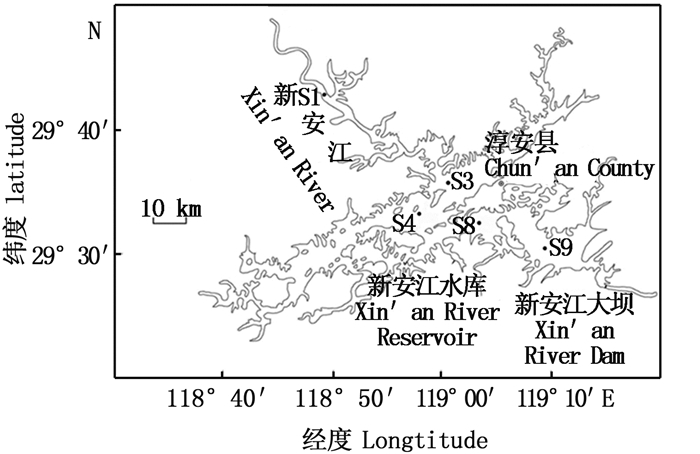 Phytoplankton functional groups and their spatial and temporal distribution characteristics in Sanbanxi Reservoir, Guizhou Province[J]. Acta Scientiae Circumstantiae, 2015, 35(2): 418-428. 刘歆璞, 张玮, 王丽卿, 等. 青草沙水库浮游植物群落结构及其与环境因子的关系[J]. 上海海洋大学学报, 2015, 24(4): 532-543. LIU X P, ZHANG W, WANG L Q, et al. Structure of phytoplankton community and its relationship with environmental factors in Qingcaosha Reservoir[J]. Journal of Shanghai Ocean University, 2015, 24(4): 532-543. 秦雪, 徐宾铎, 杨晓改, 等. 黄河口及其邻近水域夏季浮游植物群落结构及其与环境因子的关系[J]. 水产学报, 2016, 40(5): 711-720. QIN X, XU B D, YANG X G, et al. 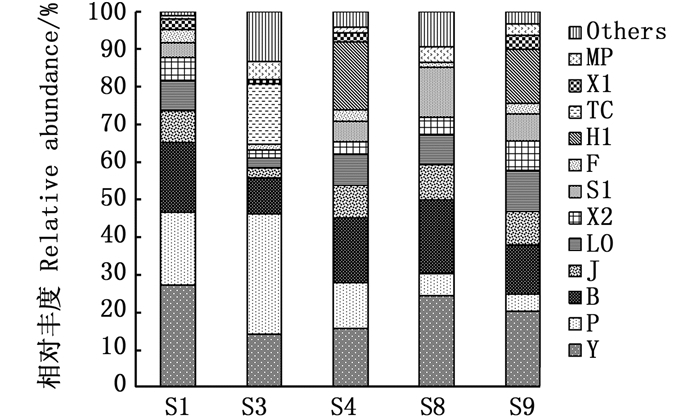 Phytoplankton community structure and its relationship with environmental variables in summer in the Yellow River Estuary and its adjacent waters[J]. Journal of Fisheries of China, 2016, 40(5): 711-720. Abstract: In 2015, the phytoplankton sampling was conducted in Qiandao Lake, and the phytoplankton community structure characteristics, the trend of change and the division of phytoplankton functional groups were studied. Two hundred and one species of phytoplankton were identified. The number of species of Cyanobacteria, Cyanobacteria and diatoms was dominant throughout the year. The average biological density in 2015 was (1285.41 ±448.43)×104 cells/L, and the average biomass was (2.75 ±0.81) mg/L. There were significant differences in biological density and biomass between months (P < 0.001). 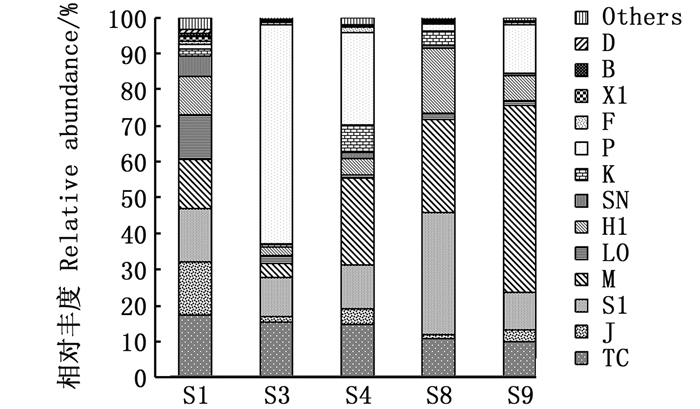 Phytoplankton functional groups S1 and H1 had higher abundance ratio in the four seasons. The B phytoplankton functional groups had a higher proportion in spring and winter, and the J phytoplankton functional groups accounted for higher ratios in spring, summer and autumn. K was higher in spring and autumn, and TC was higher in summer, autumn and winter. 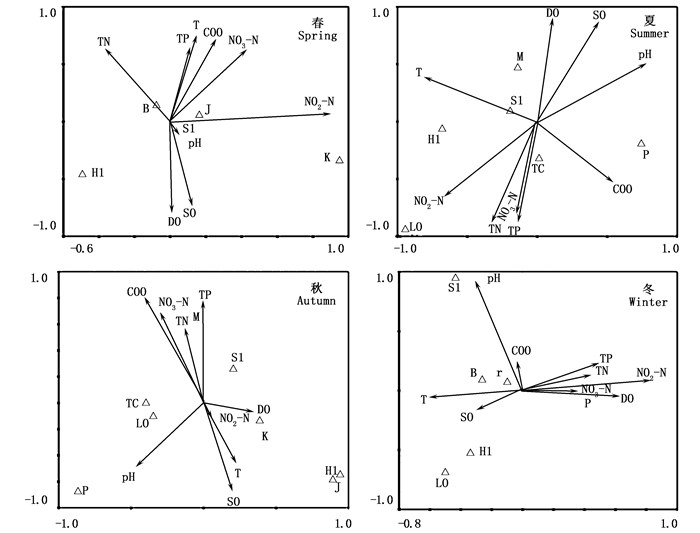 M, LO and P phytoplankton functional groups have higher abundance ratio in autumn and summer' and the Y functional group and D functional group are higher in winter only. CCA canonical correspondence analysis revealed the relationship between functional groups and water temperature and nutrients.